Vesryn appears to be a young elven man, tall and hardy of figure, with piercing blue eyes that provide a stark contrast to his dark hair. The scent of ash and leather rarely leaves his vicinity, marking him as a ranger of the woods. His right arm, when exposed, reveals a dark tattoo of an abstract winding shape, vaguely reminiscent of glyphs in Espruar (the elven alphabet). It covers an older, fainter mark on his flesh, though it is difficult to make out what it might have been. His smile is oft wry and cynical - a smile that suggests he may be enjoying a private joke of some sort. The offspring of a union between two rather insignificant elven houses, Saelrien and Kyralith (Moon elven and Wood elven, respectively), Vesryn and his sister, Aurae, lived their lives in relative peace on the fringes of the High Forest, often partaking in hunting and foraging with their less “civilized” relatives. Things changed, however - as they are wont to - when the siblings reached adulthood. The disappearance of his sister was a mystery he could not remain complacent with, and Vesryn soon set out to discover her fate. The scant few clues he had found in her wake have led him into far more trouble than he bargained for. Rarely ever speaking of his journey up until his arrival to the forest of Cormanthor, what little information may be glimpsed is often rumored to be some manner of run-in with the Black Network. His presence in the Dalelands suggests that his search has finally brought him here. The Kyralith clan is comprised prominently of Sy'Tel'Quessir (Wood Elves), and can trace their lineage to the ancient kingdom of Earleann. Their seal is a prowling lynx set against a dark green field. The Saelrien clan is comprised prominently of Teu'Tel'Quessir (Moon Elves), and claims to be the descendants of the fragmented houses, Alastrarra and Ongluth. Their seal is a falcon against a full white moon set on a midnight blue field. A lone wolf type, Vesryn's personal relationships are rarely very deep ones; the elf prefers to keep people at a distance. He seems most at home with other rangers he's happened upon on the roads, as well as local community druids. During his stays in civilized lands, he seems to favor the company of rogues and the morally questionable in the dim light of seedy taverns. He is courting Dovaeryn Quelinte, a moon elf native to Battledale and with a cheery outwards personality, much unlike his own. 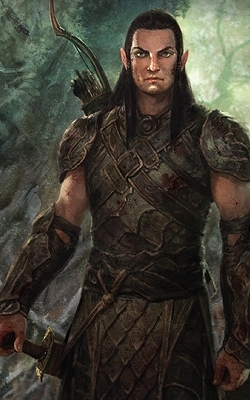 He is known as a staunch vanguard of elven interests in Faerûn following the Retreat, though he remains vehemently opposed to extreme groups that promote elven isolation or absolute prominence, such as the Eldreth Veluuthra. As he doesn't indulge many in his search for his sister, Vesryn's supposed reason for being in the Cormanthor are the ruins of Myth Drannor and the Elven Court - and such is not far from the truth. Though drawn to the region by misfortune, Vesryn is not without a remarkable interest in the history of elvenkind, being an expert on the subject of fabled Cormanthyr and its four communities: Myth Drannor, Semberholme, the Elven Court and Tangled Trees - a fact that may surprise many, given his outwards appearance is not typical for a historian. He is also known for being a practitioner of Gyrlaszthraen, an elven fighting style that focuses on agility and swift strikes to cripple the enemy. As Vesryn's stay in and around the Cormanthor lengthens, word spreads that he seeks a means to gather the scattered elven folk or promote their presence as a peoples in the region lest they fall to the wayside, and be ignored. Much in part due to his clear disdain for politics, some hypothesize that he seeks someone able to lead this effort and help elevate him to prominence. Please Note: The following links largely include Out-Of-Character information about Vesryn.